Let’s pretend you want to measure the temperature inside a vat of pressurized acid. You’d rather not drill a hole in it to insert a thermometer, but a temperature sensor sealed in Pyrex that wirelessly transmits the data and never runs out of power is a permanent and cheap solution. The researchers have their sights set on glucose sensing and that news come shortly after Alphabet gave up their RFID quest to measure glucose through contact lenses. 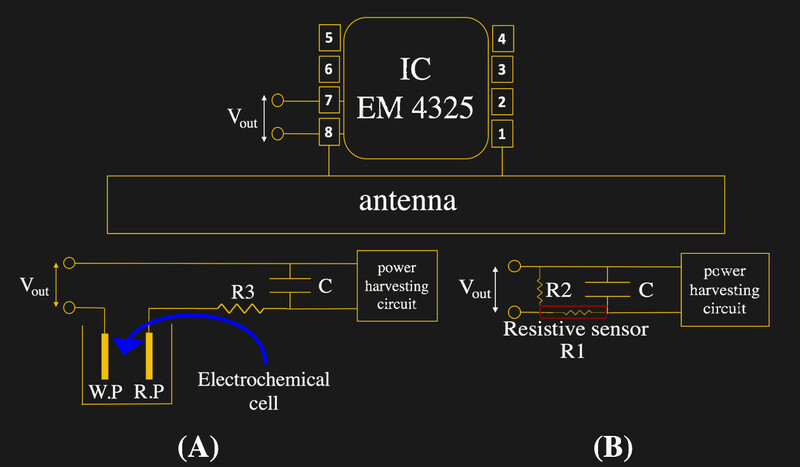 Shown the top of this article is a prototype for a Battery Assisted Passive (BAP) RFID sensor that uses commodity glucose testing strips, sending data when the electrochemical reaction occurs. It uses six of these cells in parallel to achieve a high enough peak current to trigger the transmission. But the paper (10.1109/RFID.2018.8376201 behind paywall) mentions a few strategies to improve upon this. However, it does prove the concept that the current spike from the test strips determines the time the tag is active and that can be correlated to the blood glucose detected. How many of our own projects would instantly upgrade with the addition of a few sensors that were previously unobtainable on a hacker budget? Would beer be brewed more effectively with more monitoring? How many wearables would be feasible with battery-free attachments? The sky is the figurative limit. But for all the benefits of CGM, it’s not without its downsides. It’s wickedly expensive in terms of consumables and electronics, it requires an invasive procedure to place sensors, and even in this age of tiny electronics, it’s still comparatively bulky. It seems like we should be a lot further along with the technology than we are, but as it turns out, CGM is actually pretty hard to do, and there are some pretty solid reasons why the technology seems stuck. Diabetes is a disease that, among other things, has significant effects on the feet due to a combination of neuropathy, vascular issues, and other factors. You may have seen special diabetes socks with features like non-elasticated cuffs for better circulation and a lack of seams to prevent the formation of blisters. Taking care of your feet is essential in diabetes to prevent injury and infection. Ebers is a project that seeks to help in just this area. Ebers monitors plantar pressure, temperature, and humidity in the sole of the shoe. It then feeds this data back to a smartphone for analysis over Bluetooth. The brain of the project is an Arduino Pro Mini which is tasked with interfacing with the various sensors. The project relies on 3D printed insoles which fit inside the shoe of the wearer. This is a particularly useful application of 3D printing, as it means the insole can be customised to fit the individual, rather than relying on a smaller selection of pre-sized forms. This has the additional benefit of allowing the insole to be designed to minimise pressure on the foot in the first place, further reducing the likelihood of injury and infection. The pressure sensing is actually built into the insole itself, and can measure pressure at several different areas of the foot. Overall, it’s a project with huge potential health benefits for those with diabetes. We look forward to seeing where this project goes in future, and how it can bring improvements to the quality of life for people the world over. Glucometers (which measure glucose levels in blood) are medical devices familiar to diabetics, and notorious for being proprietary. Gentoo Linux developer [Flameeyes] has some good news about his open source tool to read and export data from a growing variety of glucometers. For [Flameeyes], the process started four years ago when he needed to send his glucometer readings to his doctor and ended up writing his own tool. Previously it was for Linux only, but now has Windows support. Glucometers use a variety of different data interfaces, and even similar glucometers from the same manufacturer can use different protocols. Getting the data is one thing, but more is needed. [Flameeyes] admits that the tool is still crude in many ways, lacking useful features such as HTML output. Visualization and analysis are missing as well. If you’re interested in seeing if you can help, head over to the GitHub repository for glucomerutils. Also needed are details on protocols used by different devices; [Flameeyes] has only been able to reverse-engineer the protocols of meters he owns. Speaking of glucometers, there is a project for a Universal Glucometer which aims to be able to use test strips from any manufacturer without needing to purchase a different meter. Thanks for the tip, [Stuart]!